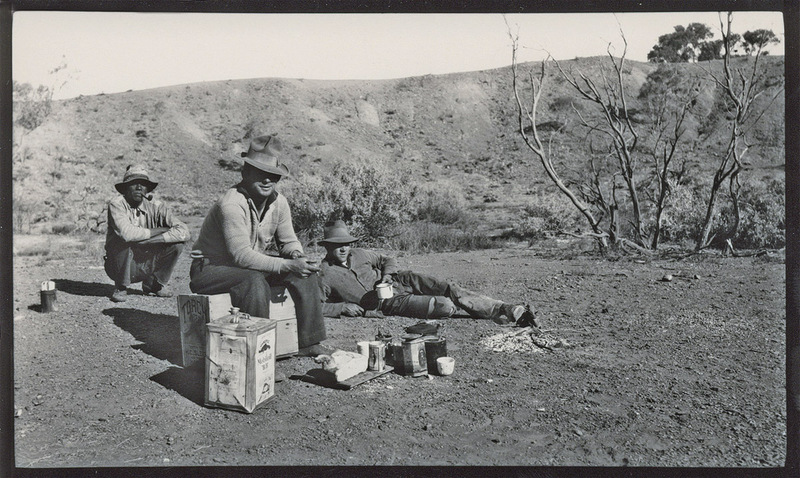 In 1931, the cluster of craters at Henbury Cattle Station south of Alice Springs in Central Australia was one of the first places on Earth where a group of impact structures could definitely be linked to the fall of iron meteorites. It was also the first place where radial rays and loops of ejected rock material, comparable to those seen around craters on the Moon, were observed. 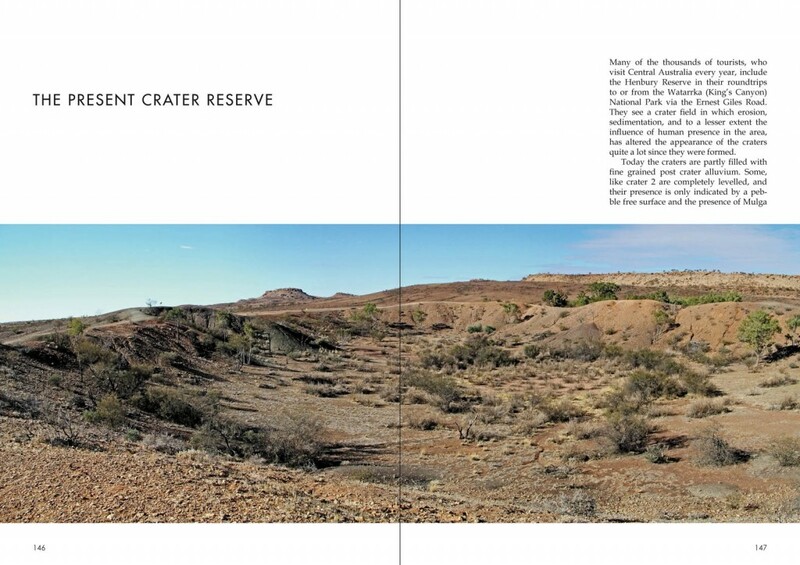 As such it was one of the primary observation sites associated with the science of meteoritics in its infancy. In this work the authors present previously unpublished documents covering early research at the Henbury site, provide an extended data set on the distribution of meteoritic material at Henbury craters, and compare recent discoveries on the mechanics of hypervelocity impacts with evidence collected over 80 years of research at the Henbury meteorite craters. 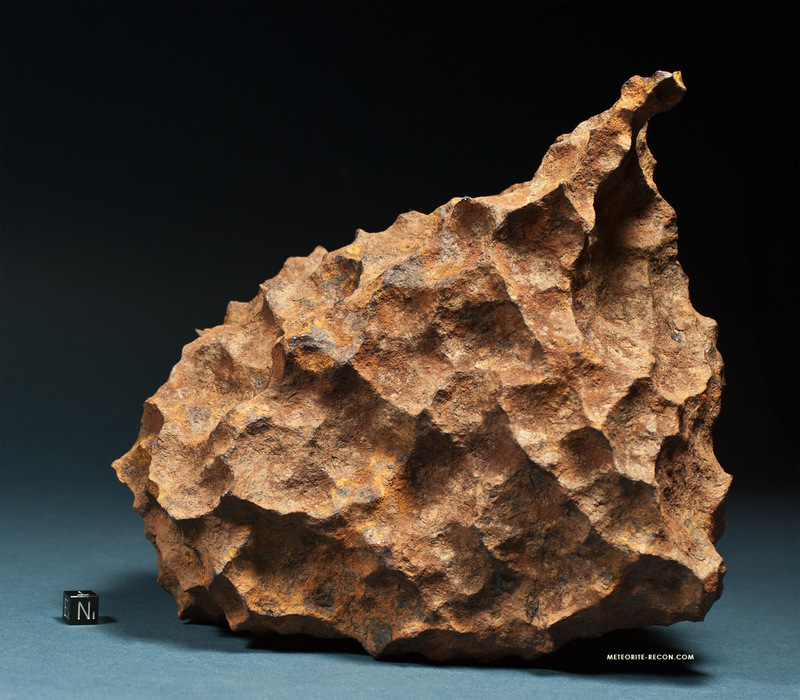 In their conclusion the authors suggest a new hypothesis for the fragmentation and incident direction of the crater for­ming bolide, on the basis of a more complete set of data compared with previous models. 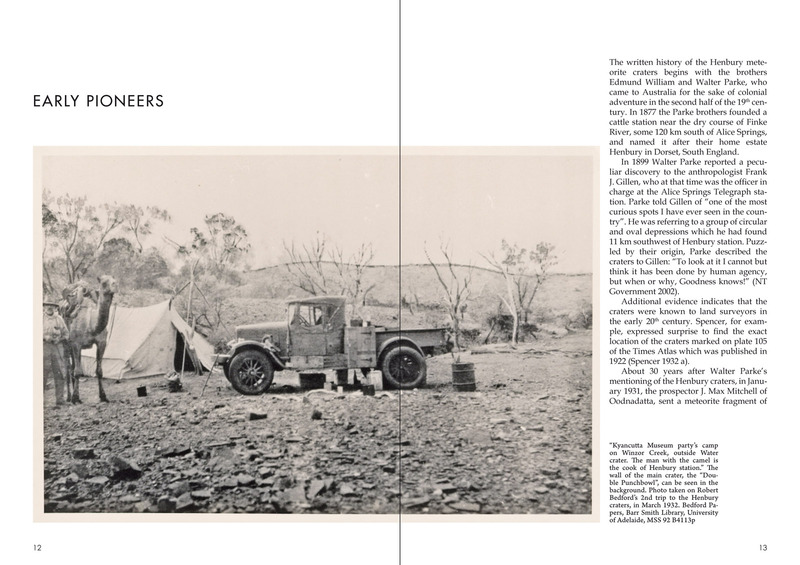 On 168 pages, Henbury Craters & Meteorites features 127 full color and black & white photos including numerous archive documents. 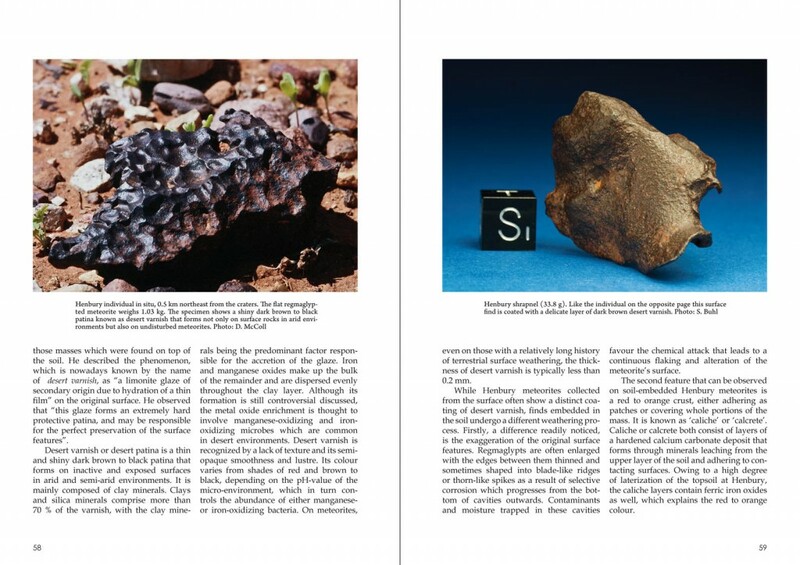 These were contributed by the world‘s leading Natural History Museums and scientific institutions, such as the Smithsonian in Washington D.C., the Natural History Museum in London, the University of Adelaide, the Barr Smith Library, Adelaide and the South Australian Museum. 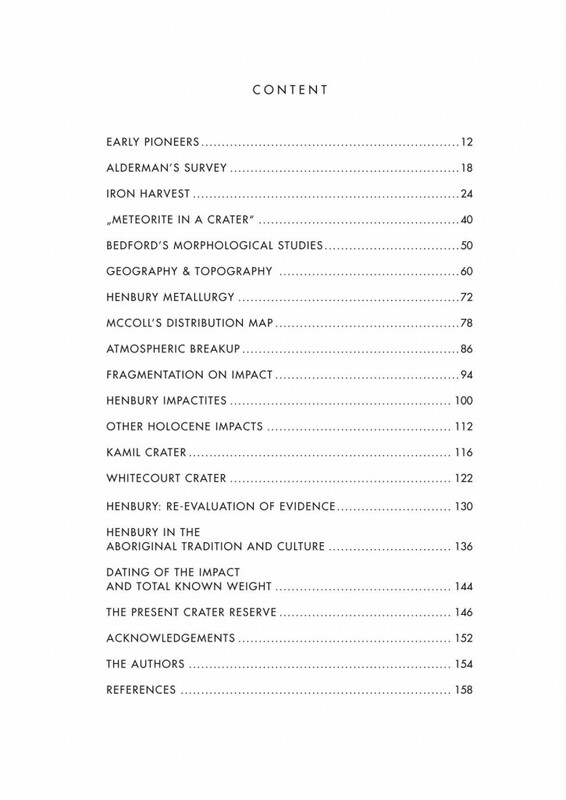 The vast majority of the photos, diagrams, maps and documents presented in Henbury Craters & Meteorites are published in this work for the first time. 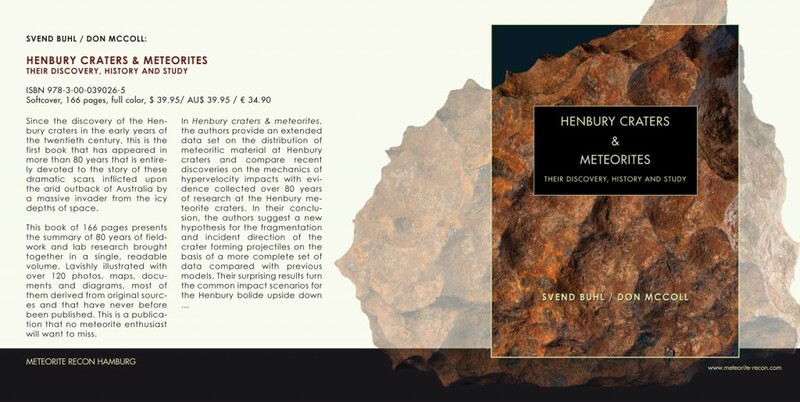 Henbury Caters & Meteorites – Their Discovery, History and Study. If you wish to order a copy, please send us an email.